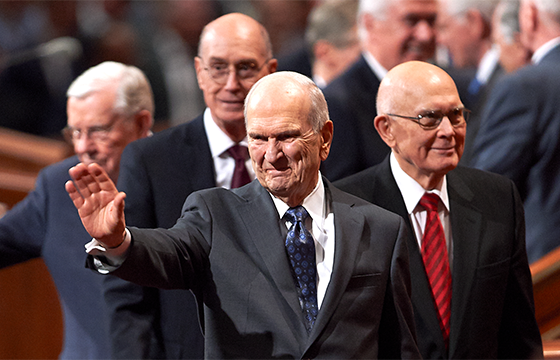 Among the first Church members to visit Saipan were American servicemen in 1944, including L. Tom Perry, later a member of the Quorum of the Twelve Apostles. Missionary work in Saipan began in the early 1970s, but was stopped because of local hostility. In February 1975, Elders Jeff Frame and Callis Carlton began full-time missionary work. One of the first group meetings on the island was held 24 July 1975. Church member Alfred "Mustang" Gonzalez became construction manager of the new airport, arriving 16 July 1975. His family followed him in October. They bought a small vacant quonset hut that had been abandoned in the jungle and used it for a meetinghouse. After this building became too small, meetings were held in the elders' kitchen and living room. Sunday School classes were held outside under the coconut trees. A small building was completed in 1983. Brad T. Nago and his wife, Jean, were converts in Saipan, baptized 24 January 1976, and became president of Saipan's Chalan Laulau Branch (a small congregation) after the Gonzalez family returned to Hawaii. In 1980 when the Micronesia Guam Mission was created, the Saipan Branch had 85 members. President Gordon B. Hinckley, Elder Joseph B. Wirthlin and their wives visited briefly and met with 10 missionaries and about 60 of Saipan's 300 members during a refueling stop en route from Asia on 1 June 1996. Elders Stephen Jones and Kamealoha Kaniho were assigned to open Rota, an island in the Northern Marianas, for proselyting on 5 September 1986. Work was opened on Tinian 14 August 1992, by Elder James Adamson and an Elder McCune.